A REVOLUTIONARY INTELLIGENT HI-TECH SYSTEM FOR SUPERIOR ASSEMBLY EFFICIENCY. The Essentials building system is a result of 2 years of research and development of a revolutionary patented Click’n’FixTM system. Developed through a collaboration between our team of professional industrial designers and hi-tech manufacturing specialists, the system utilises 3D manufacturing technology. With this system we are amongst the early adopters of how hi-technology, such as 3D printing, which is changing the nature of manufacturing and construction. The modular Click’n’FixTM system consists of steel framing members accurately cut with 3D laser with specific tongue and slot features which allows the frame to self-locate, click together and then be fastened through pre-drilled holes which line-up perfectly. No need for any marking out, drilling holes, or welding on connection plates. The system parts have an accuracy of 0.1mm which guarantees an extremely high level quality of work and finish. The system allows for vast improvements for onsite assembly. A two booth building can be assembled, fastened to the cast in situ slab, and clad and roofed in 20 man hours. The components are designed in such a way that assembly errors through incorrect position of a component in the assembly is eliminated. 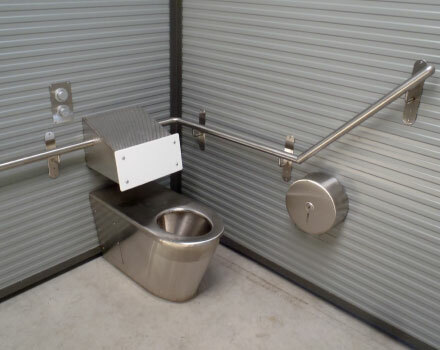 This ease of assembly factor makes it favourable for community and public service organisations to construct a public access toilet that is compliant and fit for purpose. Supplied as kit or turnkey solution. Design features to enable efficient plumbing and electrical fitout and maintenance. Service duct option to house concealed plumbing and cisterns with easy maintenance access. Full design options such as roof pitch (skillion, gable, curved or custom), cladding type (Custom Orb, Premier Sheet, Mini-orb, Panel-rib, Cement fibre sheet or hybrid). 3 week delivery time on kits, including all hardware, fasteners, building approval documentation and engineering certification. Smart natural ventilation and drainage design and use of natural UV light reduces cleaning and energy requirements. Pre-fab construction permits lean energy usage and control. We are an Australian owned company with all of our products Australian made. 97% of our materials and part units and are from Australian sources. Pre-fabricated approach to design and manufacturing allows a superior integrated design using advanced manufacturing technologies and environmental sustainability management. 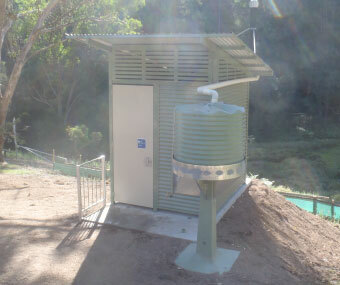 Pureablue developed fixings, continuously refined over time to handle public toilet application (abuse). All fixings flush mounted with only access from secured rear service duct. Hygienic, clean and simple design. Vandal resistant yet softened appearance. Inclusive and User-centric design principles - simple non-complicated operation. Hygienic, easy to clean materials and surfaces. Smart plumbing design layout with easy, clear access from rear plant room for efficient clearing of blockages. 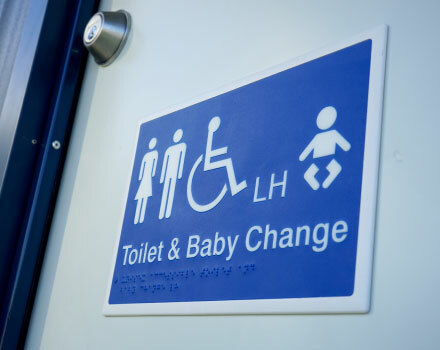 Pureablue is a specialist provider of public toilet restroom buildings for facilities in remote locations, roadside rest areas, and urban community parks. © Copyright Pureablue 2017. All Rights Reserved.